My family and I went on a vacation, which basically means we locked ourselves in a hotel room for four days, watching TV. Well, to my utter disappointment, they didn’t have the Food Channel. What kind of messed up hotel doesn’t have Food Channel?! Seriously, it’s the only time I’m able to watch it! After getting over my tantrum, I flipped through the channels. Luckily, one of the channels – I can’t remember which – had “Cake Boss”. It’s a show about the drama, excitement, and challenges of working in a bakery. It inspired me to bake. Oh, I wanted to bake so bad. 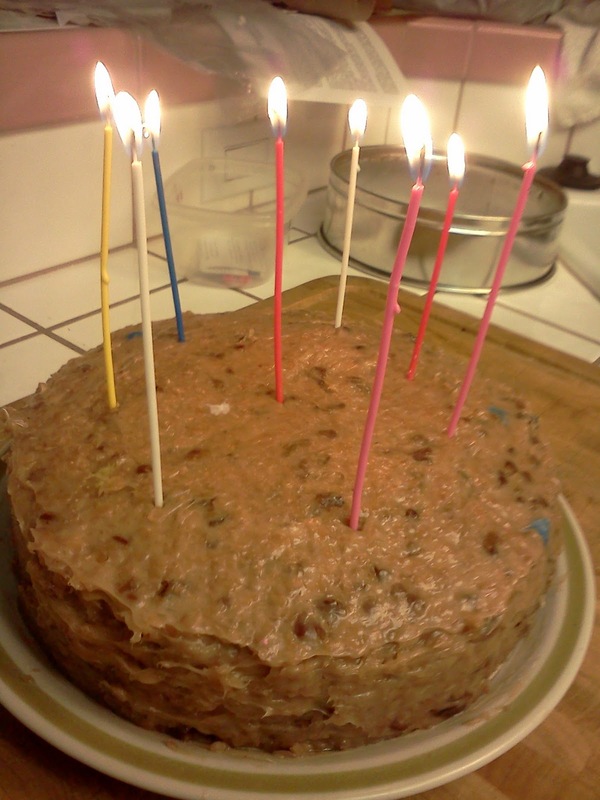 The day we got home, I helped unpack, took care of everything around the house, and got to work on a German Chocolate cake for my dad’s birthday. I made it from a mix. Call me lazy, but after a five hour car ride, what can you expect? It turned out beautifully anyhow. I iced it without a problem, then started digging through the drawers, trying to find the candles. None in the junk drawer. I looked in the pot-holder drawer. Just a timer. Did we seriously not have any candles? It just isn’t a birthday cake without any candles. I checked the junk drawer again. Aha! Found ’em. I don’t know why things go wrong when I’m trying to bake, but the darn lighter wouldn’t light. How pathetic is that? I mean, it’s got one job in the world, and it fails at that one thing. I tried, tried, kept trying. Switched from pushing the gas, then the spark, to pushing the spark, then the gas. None of it was working. I tried using the stove to light it, thinking that the spark was broken. But that didn’t work either. I’m going to be honest with you. I thought that was it. There was no hope in the world for me to light these candles with a broken lighter. I’ve got that kind of one-track mind. If I’m focused, don’t be heartbroken if I completely pass you by. I’m just that focused. I guess I was in this mindset because it didn’t even occur to me that I should use the stove to light the candles. My mom suggested it. I’m not a blond, but I sure felt like one. Taking a candle out of the cake, I lit it on the stove. The second there was a flame, it started dripping blue wax everywhere. I tried to light the rest of the candles quickly, but the flowedge was crazy. It was ruining my wonderful cake. I lit a different candle and tried to use that one. The only difference was the white wax. There was no winning this battle. I did the best I could, but at the end, this looked like a cake that came out of a paint ball war. If it isn’t one thing, it’s another, right? I told my family to scrape off the little splatters, and they’d be fine. And the cake really did turn out well.